Simon Dixon knows electronics but needed help to run his own business. Sandman Electrics is now well on its way to success thanks partly to advice from the Small Business Mentoring Service. Simon started Sandman Electrics in 2010 after completing his apprenticeship and A Grade Electrical Trade qualification. He had an extensive knowledge of the trade. 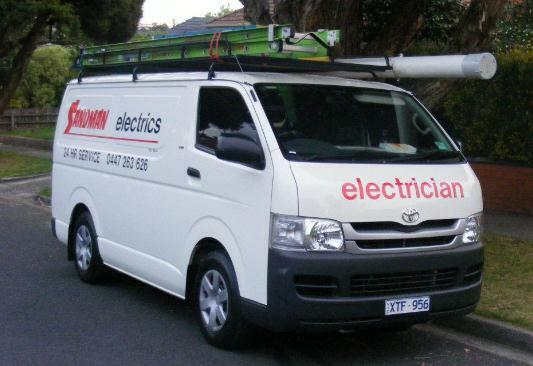 Sandman Electrics serves metropolitan Melbourne specialising in all electrical services, data services and sound systems. Simon has one full time second year apprentice and a VCAL student. The business provides household repair and maintenance services such as power point re-wiring and fixing lighting faults and commercial work including the tagging of shop machinery refitting and electrical maintenance at schools and churches. Customers are mainly private households, churches, schools and small commercial businesses such as retail outlets and shop fitters. Simon is a reliable, youthful well presented tradesman with an understanding of his business that some of his smaller competitors don’t have. But he wanted to run it more efficiently and take that next step to real, sustained success. After reading about SBMS in a newspaper article, Simon rang SBMS representatives and was referred to its website. He went through the list of mentors on the website and chose René Blaszak. The SBMS is a non-government non-profit organisation of volunteer expert mentors who give their time and experience to help small business. It is supported by Small Business Victoria, which refers clients to it. René is a recently-retired dynamic manager with a successful history of profit improvement via sustainable cost reduction, restructuring and business development/marketing. He is particularly skilled in strategic/business planning and realistic objective setting. Interim measures to maintain business momentum while principal’s ill health precludes his full participation (key man syndrome). René said Simon’s business had good potential. He said profitability had increased since they started their sessions and Simon began acting on his advice. Since the first session profits have increased by 50 per cent, sales by about 80 per cent and new customers and enquiries by 100 per cent. Simon was also able to put his staff on a profit share bonus system. Simon said René had been a great help in a number of areas. For example his long and medium term planning had improved and he had better defined the roles of himself and his staff. “It has helped me improve cashflow, cashflow forecasts and predicting upcoming workloads,” Simon says. He also manages his time and reporting systems better. “I now understand the advantages of taking holidays and not working seven days,” he says. Simon found the sessions enjoyable but also “quite challenging at times”. “René has a broad range of knowledge and a very good talent of explaining ideas in an interesting and understandable way,” he says. Simon says without René’s help he would be “back on wages, if I could find a job”. “I now realise how little I knew and that I was flying blind before René explained things to me and made me look at my business from the outside,” he says. “I think the best thing about the mentoring and this mentoring system is that there is a real honesty between the mentor and the business owner. It is a lot better than a highly paid business coach as a mentor can be more blunt and honest in pointing out mistakes the business owner may be making. Simon would also like to see an online system that keeps the clients on track, which would ensure clients followed up on their mentoring. “I feel it is a bit easy for me to lose focus and not undertake all the ideas René gives me,” he says.